I’m sure you have been hearing a lot about aerodynamics and golf science lately. Especially as it pertains to drivers. Every time I start to research new drivers, there are so many manufacturers claiming to have some new science that lets their clubface slice through the air faster. For you and I, that means faster swing speeds and closer to 300 yard drives. What is this science? Is this the same thing as the reason for dimples on a golf ball? Is it just a marketing gimmick? Or is it legit? Let’s see if we can try and get to the bottom of all this! By now, I’m sure you know the general story of the golf ball and why it has dimples. The dimples decrease drag and lengthen ball flight. Let’s take a trip into the golf science of what’s going on. If we could zoom in and see the air molecules right at the surface of the ball, we would see that they are getting stuck to the surface due to friction. In fact the velocity of the molecules right at the surface would be zero. As we moved outward away from the surface of the ball, the air molecules would be feeling the effect of the friction and would be exhibiting a decrease in velocity. At some point, after moving far enough away from the surface, the molecules don’t even know that a ball is traveling through them. The thin region of molecules which is being affected by the skin friction of the ball is called the boundary layer. 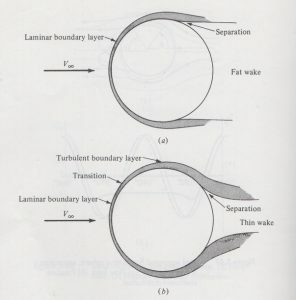 There are two types of boundary layers, laminar and turbulent. Laminar flow contains streamlines of molecules which are moving smoothly one behind the other in an orderly fashion. Turbulent flow is chaotic; streamlines break up and molecule movement is random. Both types of boundary layers will eventually separate from the surface. Turbulent boundary layers want to stick to bodies moving through them. So as the molecules move to the back side of the ball, they stay closer to that back side of the ball more than a laminer boundary layer will. They wait to separate off the back. Why is that important? Well, once the air molecules separate off the back, they swirl around, cause eddies, and create a low pressure area directly behind the ball. However, this low pressure isn’t acting alone. It is a lower pressure than the area directly in front of the ball. Air will always want to move from high pressure to low pressure to equalize itself, so the higher pressure air exerts a force against the front of the ball. This is the drag vector acting in the opposite direction of the forward velocity vector…you will hear this referred to as pressure drag. 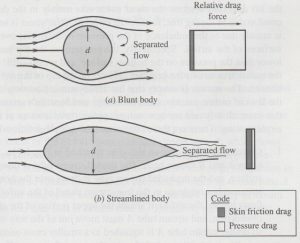 So back to the low pressure area, directly behind the ball; if you can minimize that low pressure area on a blunt body, you will decrease the drag vector. The dimples on a golf ball transition the boundary layer from laminar to turbulent early on the body, the turbulent boundary layer sticks to the back side longer, decreases that low pressure area behind the ball, and thus decreases drag. The same principles of golf balls apply to the heads of drivers. On your downswing, air molecules are flowing around the head and there is the presence of skin friction and flow separation leading to skin drag & pressure drag respectively. The head of a driver is still considered a blunt body, such that pressure drag will dominate over skin drag on your downswing. As a result, we have seen an increased emphasis on aerodynamics for these clubs. The Computational Fluid Dynamics models (CFD) have become so powerful that they can predict precisely when the boundary layer will transition from laminar to turbulent. Remember, turbulant boundary layers will wait longer to separate from the trailing edge and thus decrease pressure drag. That means faster swing speeds for us. The turbulators on the leading edge are transitioning the boundary layer to turbulent flow exactly like dimples do for a golf ball. 1 Pings/Trackbacks for "Golf Science: Aerodynamics of Golf Balls and Drivers"